Instructor training enables companies to have their own RTITB Forklift Instructor, who is able to train and examine operators on company premises. Also it could be an opportunity for an individual to embark upon a rewarding career as a recognised RTITB instructor. The course complies with the approved code of practice issued by the Health & Safety Executive. We offer the RTITB Instructor training course at our training centre in Warrington, Cheshire. We use all the best tools and equipment to assist trainee development. Our Instructor Mike Hammett has a lot of experience in this course, has a very good success rate and offers alot of after care too! Once an Instructor has passed their RTITB Instructor training course they can always come back to him and receive professional advice. We go the extra mile! The Instructor training course caters for candidates seeking to become an RTITB Registered Instructor. Previous fork lift experience is strongly recommended and candidates must have a current counterbalance certificate dated within 12 months prior to the course start date. Refresher courses are available prior to instructor course extending the duration by one day to 11 days. On completion of the course the successful candidate will be qualified to teach and train on all Industrial Counterbalance and Reach trucks for which they are certificated to use as operators. The employer should carefully select the correct person for the job as an instructor. They should be literate and numerate with good presentation skills. The RTITB recommend that candidates have a minimum of 6 months operating experience before attending the course. At the end of the course the selected person will have to demonstrate their skills to the RTITB external Examiner both theoretically and practically. 3 or 5 days for Re-qualification or Re-Registration courses. 5 days for Assimilation Courses. 10-12 days for the Novice RTITB instructor training course. RTITB Training Recommendations and Trainers Guide. 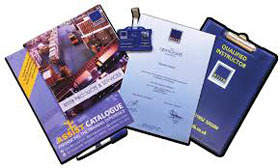 All original documentation supplied by examining body and HSE. Prices are available on request and should you require any further information please do not hesitate to contact us. We also offer In-House Instructor training to suit companies needs and these are of five day durations, please contact for further details. Please feel free to download our Course Syllabus’s below and decide which course best meets your needs. We still have spaces on our RTITB Instructor course in 2019. The dates are Thursday 11th April to Friday 26th April 2019. Please contact us on 01925 446718 or fill in the contact form below for more information. See Mike at work demonstrating a lesson of De-stacking from High Level. These courses are aimed at companies wishing to use their own Instructors to train staff. On completion of these courses candidates will be qualified to register as an RTITB Registered Instructor and be able to train on anything they are currently qualified to use or operate. Courses vary depending on experience and current qualifications so please have a look at the following courses to see which suits best. More information is available at www.rtitb.co.uk.